We love movies, whether we are watching them in a theater or in our home. This collection of Study Guides gives you plot summaries, vocabulary, discussion questions and more, to help you enjoy these great films and improve your English. Movies can be a great tool to help you improve your English, so EFLsuccess.com is building a collection of Movie Study Guides (look at the drop-down “EFL Movie Study Guides” menu) that give you plot summaries, vocabulary, discussion questions and more, to help you enjoy these great films and improve your English. ALSO look at the links on the bottom of this page! 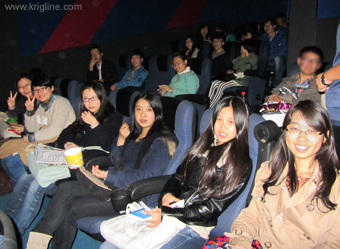 EFL/ESL Teachers: Do you love using movies to help students too? Write to me, and maybe we can collaborate to add more guides to EFLsuccess.com. See “About us” for an email address. Do you love movies? Turn them into effective language tools! 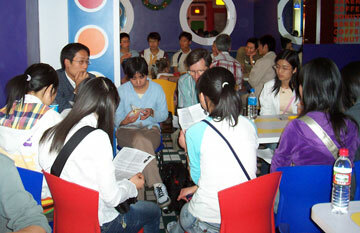 These EFL study guides can help turn great films into materials that promote English-for-success! The key difference between “movies for fun” and “movies to help your English” is repetition. I tell my students to (1) study the introductory information and vocabulary on the EFL Study Guide, (2) watch and enjoy the film with subtitles in their own language, (3) study the dialogs on the EFL Study Guide, (4) watch the film again with English subtitles, (5) discuss the movie using questions on the EFL Study Guide, and (6) review the dialogs again and then watch the film again with no subtitles. For a real challenge, watch again with no audio, and try to read the subtitles out loud in “real time”–this might be possible if you have followed the steps above! At the movie theater. The seats at our home are not as comfortable, but at least the refreshments are free! 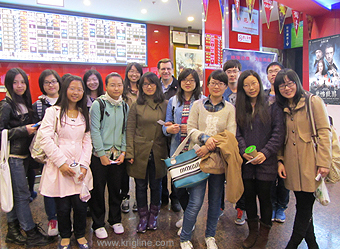 After seeing “Narnia” (at a theater in Kunming), two groups walked to Dona Doughnuts and discussed the movie, using the Study Guide available on this website. We love discussing movies with our students and friends. 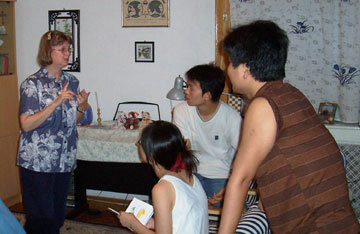 Here Vivian answers questions in our living room in Xi’an. I enjoy reviews and info about movies at Patheos Entertainment. On Mac (and newer PCs), I now use and recommend DVDFab Copy. You can try their software for free to see if it works for you; I’ve used it for many years. ©2017 Michael Krigline. See our Website Standards and Use Policy.